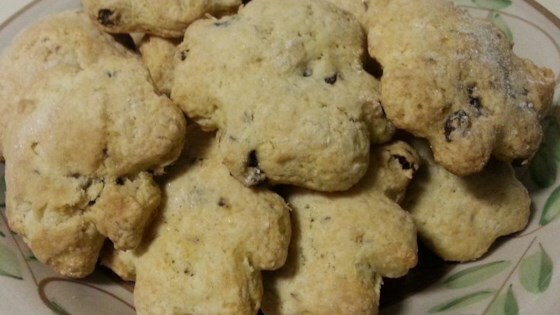 "All the flavors of Irish Soda Bread in a quick and easy cookie!" Combine dry ingredients in a mixing bowl. With a pastry blender, cut in butter until mixture resembles coarse meal. Stir in currants. Mix in beaten egg. Pour in milk and mix with a fork to make a soft dough (may need a little more milk). On a floured surface, shape dough into a ball and knead lightly 5 or 6 times. Roll out dough to 1/4 inch thick and cut into squares and triangles with a knife (approximately 2 inches in diameter). Bake for 12 to 14 minutes or until slightly browned. These were OK but I would prefer just making plain old Irish soda bread. In fact it is less work to make the bread instead of the cookies.